I first encountered these non-traditional quesadillas at a tapas party, where slices were among the small plates on offer. They’re a brilliant combination — the mild sweet potato filling, sharp cheddar cheese, a crispy tortilla — and I pretty much went straight home and wrote an email to ask for the recipe. I like these as they are for a snack or light meal. If you want to make them more substantial, you can add black beans to the filling. You can also add goat cheese, which makes the filling creamy and rich-tasting, but do so in addition to the cheddar (which plays an important structural role), not instead of. I love leftovers reheated in a toaster oven, but people who aren’t as obsessed as I am with crispness have reportedly enjoyed them reheated in a microwave too. For folks with wheat or gluten issues, I did test these with corn tortillas, and it is possible, but a bit tricky. You need to heat the tortillas one batch at a time in the microwave, wrapped in a damp paper towel, and then work quickly to fill them and get them into the pan while they’re still at their most pliable. Some of mine still cracked, but they all held on to their filling. I recommend using small tortillas so you don’t have to try to cut them after cooking. Incidentally, there’s a lot of conflicting information on what a sweet potato is or isn’t, especially when compared with a yam. In this case, the important part is to get something that’s orange on the inside, not white. 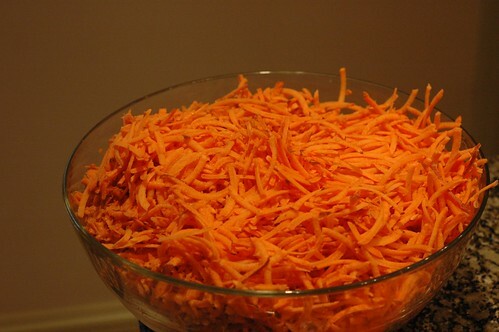 Wash and grate the sweet potatoes, then peel and dice the onion. If you’re using fresh garlic, put it through a garlic press or mince. Add the canola oil to a large frying pan and heat over medium. Then add the onion and cook until softened, about five minutes. 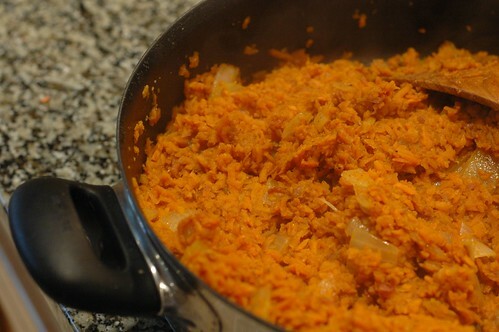 Add the cumin and chili powder to the pan and stir for a minute until they’re well mixed in, then add the sweet potatoes. Keep stirring until the potatoes and spices are mixed, then cover the pan and cook for about fifteen minutes, stirring every five minutes. If the potatoes are sticking to the pan, add a bit more oil. After ten minutes, the potatoes should be cooked through; after fifteen, the filling should be easily squishable. Add salt and pepper to taste. Remove the filling from the heat and get out a frying pan. Heat it over medium and pour a bit of canola in the bottom. You can either fill the tortillas directly in the pan or fill them on the counter and then stick them in the pan. Either way, you want to smear half of the tortilla with the sweet potato mixture and then top it with a couple of tablespoons of the grated cheese. 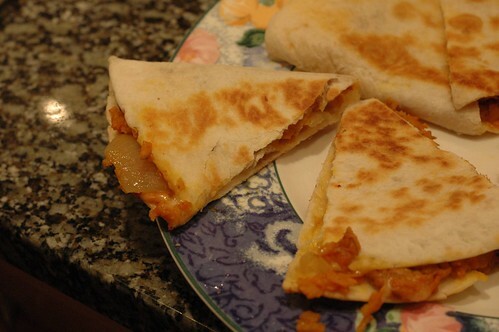 Cook one or two at a time in the skillet until the tortilla is browned and the cheese is melted, then turn over and brown on the other side before moving them to a wooden cutting board. Some cutting recommendations: kitchen shears and a pizza wheel both work well for this, but I end up using my chef’s knife most of the time. Cutting into thirds is easier than quarters. Don’t sweat the messiness of the middle pieces; they still taste good. I like these with salsa on top; I hear they’re also good with sour cream if you like that sort of thing. *I used the Ancho chili powder from Penzey’s, which is flavorful but not hot. If you prefer heat, go for a hotter blend. Among grocery store brands, Cook’s Illustrated likes the Spice Island blend best. Chili powders vary tremendously, so finding one you like is an experiment that will serve you well in the future. **I have made this with all kinds of cheeses and like sharp cheddar the best. I can buy grated Cabot “Seriously Sharp” cheddar at my grocery store; you could also grate this amount on a box grater without too much trouble. As usual, I recommend avoiding anything unnaturally orange. Those sound really yummy, and I frequently get sweet potatoes in my farm share. I assume you add the garlic after the onions are mostly done? I usually add them at the same time. The combination of moderate heat and my obsessive need to stir things in pans has meant that burning hasn’t been a problem for me, but you know your own stove (and level of stir-happiness) best!